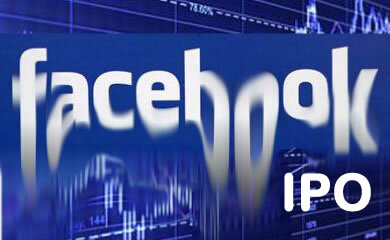 The Facebook IPO at $38 a share to raise $18.4billon is expected to value the social media company at over $100 billion that reeks of another LastMinute Dot com investors being suckered moment. Now Facebook clearly has value by virtue if its 900 million subscriber base, however valuing the company at X100 earnings is well on par with that of the peak of the last dot com bubble. The IPO itself illustrates that public investors are being sucked in by media hype as the amount to be raised has risen from first $5 billion, to $10 billion and to finally over $18 billion as major private investors including Goldman Sachs and Russian billionaires cash out as they offload stock to the public. The problem with Facebook is that it is already flat-lining in terms of revenue growth so not only is it over priced at 100X earnings but there is also no significant revenue growth to bring that high valuation down. For instance Facebook promotes itself on the basis of having 900 million subscribers, however to me that suggests that it is already a saturated market, where are new subscribers going to come from to grow the revenue? Investors need to realise this that Facebook is no Google, the closest stock to Facebook is Yahoo which is priced at X17 earnings, so the Facebook IPO is being priced at X5 its real value. This suggests there is going to be a huge overhang of stock that at the very least points to a stagnant stock price for many years and more probably a severe bear market that could see a loss of value of over 80%. Comparing Facebook to the most successful internet company to date, Google which trades on a P/E of 19 means that Facebook investors face a huge challenge as Facebook would need to grow their earnings by X5 just to match Google. When the reality is that Facebook can never match Google's profitability. Future Forecast - Facebook is a re-run of Lastminute.com, and just like last minute, all of the media hype surrounding Facebook will soon evaporate and many people in hindsight will start to write how it was always obvious that the numbers never stacked up. Facebook as an investment was always destined to fail because it was not even equal to half a Google despite being valued as 5 Google's. I would not go as far as saying Facebook is the next MySpace, but its not that far off from following a similar path towards oblivion, in fact if Facebook accrues a mountain of debt then at some point it will be taken over by a cash rich company such as Google, Apple or Ebay to gobble it up at a fraction of its IPO price. I agree with almost all you have written but I welcome the FB IPO as it very effectively separates stupid people from their wealth. In a fair world stupid people should not have money but through good luck, theft, or getting it from even more stupid people, wealth often ends up in undeserving hands. Facebook just redresses the balance. Nadeem, I value your opinions on many financial matters. But on the issue of Facebook, I do believe you can't just narrowly hone in at the P/E ratio. Social networks are still in their infancy phase with FB clearly the leader with millions more users MySpace ever had. It's an evolutionary step-up if you will. Now I'm not saying FB will ever approach Google's P/E within the next few years, but I think FB's stock behavior in the next few years will be akin to Amazon's (P/E ratio of 176!!!) as they look for ways to monetize their traffic/subscribers. 5. FB is lead by a very strong team + new recruits other than CEO Zuck, in Google's ex-VP Sheryl Sandberg. FB's approval rating is very high at 4.5 (http://www.glassdoor.com/Reviews/Facebook-Reviews-E40772.htm), so they are recruiting the top grads at all the best educational institutions. FB to drop 80%? No. Overvalued? Maybe. Hi Nadeem, Was wondering if you would be kind enough to give an updated forecast of the UK economy in terms of GDP and prognosis on near term and future unemployment. Facebook is important but its largely irrelevant it will be forgotten about in 5/6 months, whats more pressing is future GDP and unemployment rates. By the way your analysis from 2010 as so far proved incredibly accurate, but unfortunately things have turned out worse than you predicted, with GDP way way way below 1%. Love the effort to save just a few people from this grossly mis-priced IPO. Trading flat-lined in the last 20 minutes at 38 to save face for the underwriters as well. Any thoughts on TLT being at the 125 previous high point of the 2008-2009? My own analysis of the rare convergence of the 400sma (recession line) and 200sma is telling me that 1250-1275 is the make or break zone if the euro-crisis is to settle down. I guess the scenario here is that either bonds breakout and we have a lehman type shock or this really is the opportunity of the year to by stocks from 1250-1300. My guestimate is 85% loss, the range is 70% to 90%. It's already down about 25% from Friday's trading high. I am taking account of more than P/E i.e. its revenue growth prospects. I'll look at the ecomnomy and other markets after another article on Financial Armageddon.